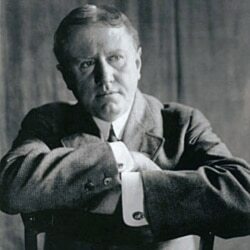 Our story today is called “The Exact Science of Matrimony.” It was written by O. Henry. Here is Barbara Klein with the story. Andy gave Jeff an unhappy look. “What does a marriage advertisement have to do with a lady?” he asked. William Sydney Porter, or O. Henry sits for a portrait. Jeff said that he knew just such a woman. Missus Zeke Trotter lived in a small town not far away. Jeff Peters went out to see her. She was not beautiful and not so young. But she seemed all right to Jeff. “Is this an honest deal you are putting on, Mister Peters?” she asked when he told her what he wanted. Jeff explained that her job would be easy. She would live in a quiet hotel and have no work to do. He and Andy would take care of all letters and the business end of the plot. But he warned her that some of the men might come to see her in person. Then, she would have to meet them face-to-face and reject them. She would be paid twenty-five dollars a week and hotel costs. So Jeff took her to the city and put her in a hotel far enough from Jeff and Andy’s place to cause no suspicion. Jeff Peters and Andy Tucker were now ready to catch a few fish on the hook. They placed their advertisement in newspapers across the country. They put two thousand dollars in a bank in Missus Trotter’s name. They gave her the bank book to show if anyone questioned the honesty of their marriage agency. They were sure that Missus Trotter could be trusted and that it was safe to leave the money in her name. Their ad in the newspapers started a flood of letters – more than one hundred a day. Jeff and Andy worked twelve hours a day answering them. Most of the men wrote that they had lost their jobs. The world misunderstood them. But they were full of love and other good qualities. ​Jeff and Andy answered every letter with high praise for the writer. They asked the men to send a photograph and more details. And they told them to include two dollars to cover the cost of giving the second letter to the charming widow. Almost all the men sent in the two dollars requested. It seemed to be an easy business. 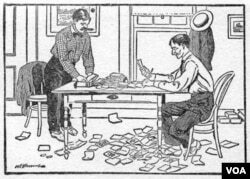 Still, Andy and Jeff often spoke about the trouble of cutting open envelopes and taking the money out. A few of the men came in person. Jeff and Andy sent them to Missus Trotter and she did the rest. Soon, Jeff and Andy were receiving about two hundred dollars a day. One day, a federal postal inspector came by. But Jeff satisfied him that they were not breaking the law. After about three months, Jeff and Andy had collected more than five thousand dollars, and they decided it was time to stop. Some people were beginning to question their honesty. And, Missus Trotter seemed to have grown tired of her job. Too many men had come to see her and she did not like that. Jeff went to Missus Trotter’s hotel to pay her what she was owed, and to say goodbye. He also wanted her to repay the two thousand dollars that was put into her bank account. When Jeff walked into the room she was crying, like a child who did not want to go to school. Jeff felt sorry for her. He said he would be glad to let her give the two thousand dollars to Mister Wilkinson, so that she could be happy. But he said he had to talk to his partner about it. Jeff returned to his hotel and discussed it with Andy. Jeff said it was a sad thing to think that they were the cause of the breaking of a woman’s heart. Andy agreed with him. Jeff shook Andy’s hand for a long time. Then he went back to Missus Trotter. She cried as hard for joy as she had done for sorrow. Two days later, Jeff and Andy prepared to leave town. Jeff was putting all the money they had received in a belt he tied around his body. Then Andy took a large amount of money out of his pocket and asked Jeff to put it together with the other money. “It’s Missus Trotter’s two thousand dollars,” said Andy. “How do you come to have it?” Jeff asked. “Then you are William Wilkinson?” Jeff asked. This story was adapted for VOA Learning English by Shelley Gollust and produced by Lawan Davis. Your story teller was Barbara Klein.